As we all saw on CBS 60 minutes last evening... the Resveratrol Product which will be available pharmaceutically in a pill form in no less than five years has now been shown to indicate it not only will interrupt and delay the aging process, but indications now are that it might well be used in treating diseases which include cancer, diabetes, Alzheimers, and Parkinsons. This was unexpected in the research and developmental stages that have led to this miraculous product. Yes, the research proved it would delay the effects of aging, but the fact that in the future, it would be used in the treatment of disease was an unexpected development. Meanwhile, we do not have to wait for a pharmaceutical product, nor to rely on a pill, when we already have all natural Vivix anti-aging resveratrol extract. We can enjoy all the benefits with just one delicious teaspoon a day. 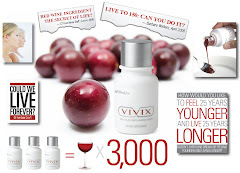 Without making any claims, we can confidently and enthusiastically present to the public the world's best anti aging resveratrol tonic: Vivix, which research has proven to address all four mechanisms of aging. Vivix is Resveratrol Plus the unique blend of polyphenols that make Vivix 10 times more powerful than resveratrol alone. Resveratrol is miraculous and we have gone beyond Resveratrol. The purity and percentage of resveratrol in a product is also an important consideration. With The Shaklee Corporation's heritage of integrity and the most extensive clinical research, we are once again number one with the best, and it's Vivix out in front all the way. They grow almost exclusively in the southeastern United Sates. They thrive under adverse conditions, perhaps due to their thicker and tougher skins compared to European grapes....muscadines have an extra chromosome(twenty instead of the nineteen other grapes have).